High-Quality Thick 14 pt. and 16 pt. Cardstock Paper. 4 Sizes to Choose From: 4"x7", 3.5"x8.5", 4.25"x11", 4.25"x14"
4" x 7"3.5" x 8.5"4.25" x 11"4.25" x 14"
Door Hanger Printing is great for your Marketing! 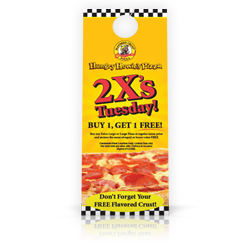 Door hangers are a great way to attract customers to your business. 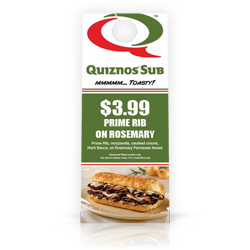 With business door hangers you can offer your customers great deals, coupons, or specials delivered right on their door. 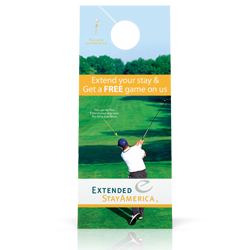 Door hangers are a get way to attract attention to your business by announcing your presence in the neighborhood. Door hangers are great a few reasons. One of them is that they are a stand-alone piece. Because of this, they do not get mixed up with other marketing material in the mailbox. Because you can hang them on doorknobs, the chance of it getting lost an go un-noticed is low. They have large print area. 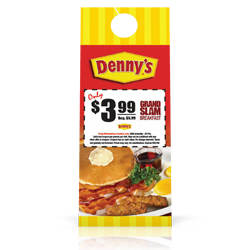 Our door hangers are available in following size: 4" x 7", 3.5" x 8.5", 4.25" x 11", 4.25" x 14". 3.5" x 8.5" and 4.25" x 11" are our most popular sizes since they are more standard sizes. 4" x 7" is a small door hanger is great for "reminders" or "sorry we missed you" applications. 4.25" x 14" is the size for those who want more space. Its 3 inches longer than our 4.25" x 11" size. However, you shouldn't use this size just because you like the size. Use it only if you really need it. Otherwise, you will end up with a long door hanger that will be hard to hang on doors and carry around for your customers and the distributor. Our door hangers are printed in full color. We use high quality 100 lb glossy paper, 10 pt. card stock with AQ coating or our premium 14 pt. & 16 pt. cardstocks. You can add a UV coating for a high gloss finish and extra protection. Our cardstock is durable and great for outdoor use. 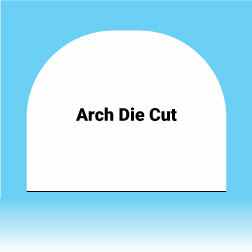 We offer 3 different die cutting options when it comes to punching. You can contact us, by phone 866-668-5152 or use our website to place your orders, download free templates, even design your door hangers online. No matter what your print-marketing campaign's needs are let PrintFirm help make your job easier. 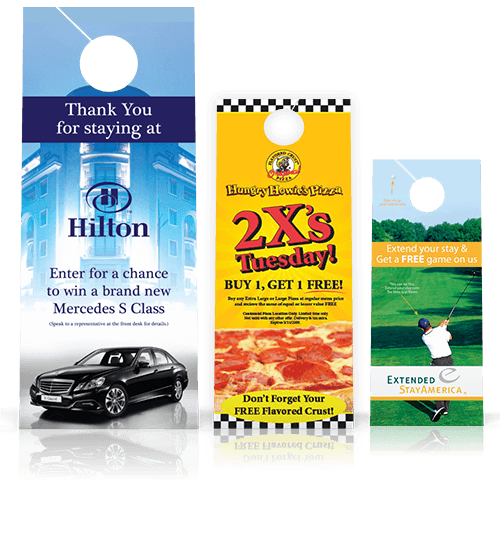 Our staff is here to provide you with all you need to make your business door hanger marketing a success.